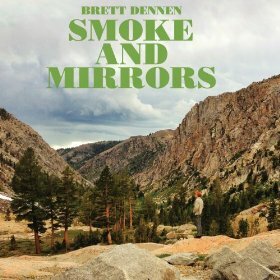 Smoke and Mirrors, singer/songwriter, Brett Dennen’s fifth album, is saturated in acoustic folk glory. As Dennen sings “Sweet Persuasion,” it is obvious that the airiness of guitars and the soft rumble and tumble rhythm of drums is carefree and masterfully built. The characteristic of Dennen’s voice is one of an eager uniqueness that rings admirable and comfortably quirky. Smoke and Mirrors is perfect for pleasure-seekers who would easily tailgate for endless summers and longer sandy beach house retreats. “Who Am I” moves with an easy country and western stroll, while the upbeat rock vibe on the fresh reminiscence of “When We Were Young” shows off a more mainstream pop side. The lullaby of “Only Want You” exemplifies a more soothing ode to a singular object of affection. The harmoniousness of “Don’t Mess With Karma” is easy and moves with a nice rhythm. The beauty of Smoke and Mirrors is that there is no sleight of hand as the title may seem to suggest.